To answer your question upfront, typically closing costs will amount to anything from 2 to 5 per cent of the total purchase price of a home. Now, the same way you can get a rough idea on the total amount of loan you can afford, via an online mortgage estimator, you can also use a closing cost estimator. Bear in mind that many will use rough approximations to work out the amounts owed for closing costs. 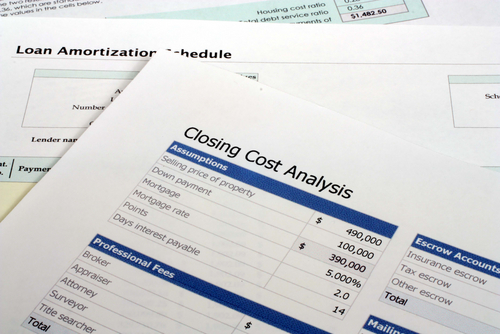 Closing costs are the expenses that have to do with buying your home, charged by the lender, as well as by third parties involved. Not only do you owe the credit institution of your choice the principal and the interest, but you also owe them (and the aforementioned third parties) some closing costs, payable when you close on the mortgage in question. If you’re wondering who pays closing costs, it’s usually the buyer, not the seller. The notable exception is VA loans, in which some of these costs are paid by the seller. The difficulty in figuring out a generally applicable closing cost formula is that these expenses are highly dependent on the location of your property, as well as the type of property purchased. Consequently, it’s tough to figure out a precise amount of money owed for closing costs, though it usually is 2-5 per cent of the purchase price. In other words, for a home that cost you $150,000, closing costs will range between $3,000 and $7,500. If you’re worried that you don’t know what to expect from your lender in terms of closing costs, you needn’t worry too much. Federal laws require them to give you, the potential debtor, a good faith estimate (GFE) of what the closing costs for your home of choice will be. They are supposed to provide this estimate within three days of the time when you applied for the loan. However, these estimates are usually gross approximations and are allowed by the law to fluctuate by up to 10 per cent. In other words, you can expect changes worth thousands of dollar to the final bill for closing costs. At this point, if closing costs appear too high, you’re better off walking away and finding better terms with a different lender. 24 hours before closing on a mortgage, the lender has to give the debtor a HUD-1 settlement statement, with a precise breakdown of closing costs. It’s usually a good idea to compare each line in this statement with those on the GFE and ask the lender what each cost is about and whether or not it can be negotiated. It’s usually a good idea to go directly to the website of your lender, much like you would before taking out a mortgage. Say you wanted to know how much Bank of America mortgage payment was; you would, naturally, use the Bank of America mortgage calculator, instead of some random online calculator from another source. They will ask you to input the property’s ZIP code and purchase price, as well as the down payment in percentage points, the loan term (30, 20, or 15 years), and the loan type (fixed rate or 5/7/10-year ARM). MyFICO also offers a rather complex and advanced closing cost calculator, which requires you to fill in the purchase price, loan amount, loan term in years, and interest rate, as well as the adjusted origination charges: the origination fee and charge for specific interest rate. You can also work in other settlement services, or certain services that the lender has asked for (appraisals, credit reports, flood certifications, tax services), title services and insurance, government recording charges, and transfer taxes. Closing costs can also include specific services demanded by the buyer, like a survey of the property and a pest inspection, and they also depend on the property’s yearly tax and yearly payable insurance.